Srinda Ashab malayalam actress profile and biography is given here. Srinda Ashab is the upcoming actress in the South Indian movie industry. She has acted in both Malayalam and Tamil language films. Before making her accidental entry in the field of acting, she was part of the technical crew that made some of the finest movies in the Mollywood. She also had a fruitful association with the modeling industry. Her debut film in the Malayalam movie industry was 22 Female Kottayam. Srinda Ashab is an upcoming South Indian Film Actress. She is primarily working with the Malayalam movie industry. Before coming to the world of cinema, she was actively participating in various modeling events. Like many upcoming artists who forayed into the field of acting after getting noticed by big tickets in the industry, she was picked up by a movie maker by the name Dileesh Nair. Since then, she never looked back and was getting a steady stream of offers from various movie directors. Srinda Ashab was born into a well-to-do Muslim family settled in Cochin, the financial capital of Kerala. Initially, she had her formal education in a school nearby. Later, she was enrolled by her parents in a reputed school in the city. Right from the childhood, she was interested in modeling. However, she never thought of trying her luck in the world of cinema and acting. As a child, she was more interested in wearing nice dresses, grooming and mannerisms. At times, she became the object of mockery by her parents and other close relatives. Despite of all these issues, she was very much concerned about her look and feel. During her high school days, she was interested in creative activities in her school premises. Due to her planning and nice timings, all her presentations at various events were hits. For these activities, she had the moral and financial support from her parents who wanted her to achieve something big in her life. Srinda Ashab was also successful in devoting enough time to her studies. That was the reason why she could gain nice marks and grades in the academic exams. By the time she reached the tenth standard, she was the confidence personified. Fearing that her performance in the tenth standard examinations might nose dive, her parents asked her to attend tuition classes for selected subjects. Due to all these contributing factors, she improved her numbers in SSLC examinations to get good grades. The good grades in SSLC examination enabled her to choose a subject of her choice for a pre-degree course. Moreover, she could ensure that her chosen subject was available at a nearby junior college. During her years in junior college, she found enough time to groom herself to become a successful model. Despite of all the busy engagements, she did fairly well in her PDC examinations and came out with flying colors. Later, she joined a reputed degree college in the city of Cochin. When she was studying for her degree, she happened to take part in a modeling event that was noticed by some powerful and influential persons in the fashion and modeling industry. They were impressed by her performances, and hence they decided to give her a chance. At a modeling event, Srinda Ashab was noticed by the heavyweights in the modeling industry. After having got impressed by her performances, these people interacted with her to know more about her likes and preferences. Finally, they decided to give her a chance to act in some advertisements, promoting various business groups of the state. Through these advertisements, she began to be liked by the people. This was how she became popular amongst the people in the modeling and advertisement industry. Later, she tried her luck in the field of documentaries. In fact when she was acting in one such documentary a director in the Malayalam movie industry by the name Dileesh Nair happened to notice her acting in it. He was impressed by her performances. What struck most to him was her face cut, which resembled like that of a character in his upcoming movie. He was looking for such a girl to give life to his character in his next film. Before making her acting debut, she was in the movie field giving technical support to some of the movies and documentaries that were made during that point in time. The transition from the technical support role to acting role was a sheer stroke of luck. Her acting and technical support role in different documentaries was noticed by the big tickets in the industry. In fact, she was an active member of the technical crew that created movies like Hero, China Town and Cassanova. 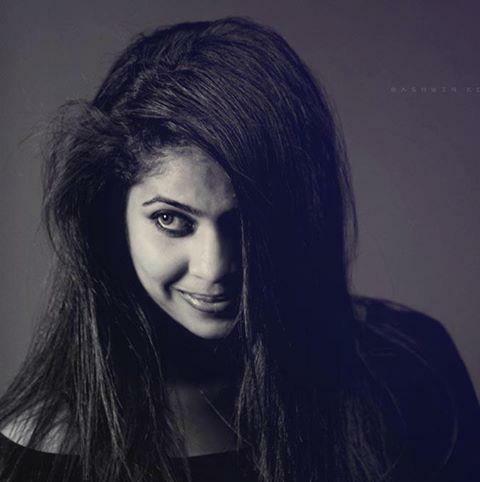 Having impressed about her performances, Dileesh Nair recommended her name to the movie director Aashiq Abu. That was how she could secure an offer to act in a movie in the Malayalam movie industry. Srinda Ashab's maiden movie in the world of Malayalam cinema was 22 Female Kottayam. This film was directed by Aashiq Abu. In this movie, she acted alongside Rima Kallingal and Fahadh Faazil. The movie featured this young actress in supporting role. On the other hand, Fahadh Faazil, the first son of illustrious movie maker Fazil, and Rima Kallingal were doing the lead roles in the movie. In this movie, she played the role of Jincy who was the best friend of the lead female character Tresa. The movie was produced by O.G. Sunil. Further the movie was produced under the Film Brewery banner. The background music of the film was scored by Rex Vijayan. The movie songs were composed by noted music director Bijibal. The film was released to the welcoming audience on April 13, 2012. The film made a huge movement at the box office of the state. The film was well appreciated by the film critics as well. For her performances, Rima Kallingal got the Kerala State Award for Best Actress. After getting noticed, Srinda started getting more offers from movie directors to act in the films directed by them. The first movie director who had come with a concrete offer was Vineeth Sreenivasan. He signed up with this upcoming actress to give her a chance to act in his movie titled Thattathin Marayathu. In this movie, she acted opposite to Bagath Manuel. However, the title roles were handled by Nivin Pauly and Isha Talwar. In this film, she again did the supporting role. The movie was produced by noted film actors Mukesh and Sreenivasan. The songs of the film were composed by Jerry Amaldev and the background music was scored by Shaan Rahman. The film was produced under the banner of the Lumiere Film Company. This film hit the screen on July 6, 2012. The songs and theme of the film were new and fresh. Hence, the moviegoers of the state took the film in their heart. The melodious songs became the household tunes in the state. This film gave a much needed boost to both the movie director Vineeth Sreenivasan and the young actress Srinda Ashab. After the success of two back-to-back films, the stature of Srinda Ashab as an actress grew several folds. So, other movie directors became aware of the talent in the actress. As a result, she started getting more offers. The other films in which she acted include Annayum Rasoolum, Artist, North 24 Kaantham, Rasputin and 1983. When she was enjoying the limelight in the Malayalam movie industry, she got acting offers from the Tamil movie industry. The maiden movie she featured in the Tamil movie industry was Vennila Veedu. In this movie, she acted alongside Senthil and Vijayalakshmi. The movie was directed by Vetri Mahalingam. The producer of the film was P.V. Arun. The film did get little response at the box office of the state of Tamil Nadu. Of these, the film 1983 is going to hit the screen in the year 2014. The shooting of the film is over and it is now undergoing pre-release processing and editing. The film Annayum Rasoolum was another one that caused some movement in the box office of the state of Kerala. In this film, she co-starred with Fahadh Faazil, Sunny Wayne, Aashiq Abu and Andreah Jeremiah, Ranjith, P. Balachandran, Shine Tom, Soubin Shahir, etc. The director of the film was Rajeev Ravi and its producers were K. Mohanan and Vinod Vijayan. This film was able to generate some movement at the box office. Sindra Ashab is an upcoming actress in the South Indian film industry. She has primarily acted in Malayalam language films. With the success of the movies in the Mollywood, she even forayed into the Tamil movie industry. Her maiden film in the Malayalam movie industry was 22 Female Kottayam, which was directed by the director Aashiq Abu. Her supporting role in the movie was noticed by the moviegoers of the state and accepted her as an actress with the whole heart. She also forayed into the Tamil movie industry when she got an offer to act in the movie titled Vennila Veedu. The movie was directed by Vetri Mahalingam. Before making her entry into the movie industry, she was actively associated with the modeling industry. Initially, she was part of the technical crew that created some of the memorable movies like Cassanova, China Town, etc. She also was part of the crew that made short films and documentaries. Her transition to the acting was an accidental one when noted film director Dileesh Nair watched her work with admiration. After watching her work, he recommended her name to Aashiq Abu who was looking for a younger face to portray a character in his new movie. Varuna Shetty malayalam actress profile, biography and upcoming movies are given here. Varuna Shetty is an upcoming movie actress. She has primarily concentrated on films made in the South Indian movie industry. Till date, she has acted in Tulu, Tamil and Malayalam language films. All these films will be released for the public scrutiny in the year 2014. Before making big in the film industry, she was busy with her modeling assignments.